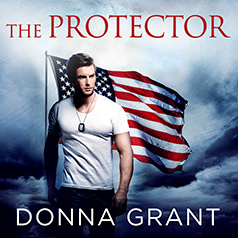 New York Times bestselling author Donna Grant presents her second novel in the Sons of Texas series. Contains mature themes. When Marine Force Recon captain Cullen Loughman learns that his father has been kidnapped, he will do whatever it takes to find him. In order to achieve his mission, Cullen will need to team up with the best of the best—someone who just happens to be the most stunning woman he's ever laid eyes on . . . This isn't the first rodeo for ex–Air Force pilot Mia Carter. Still, Cullen's bad-boy good looks and charm are distracting her from duty, and it appears that the feeling is mutual. As Mia and Cullen make their descent into a dark, dangerous world, their attraction reaches the boiling point. But is their desire worth the risk when a ruthless enemy is waiting in the wings—or will their Lone Star love conquer all?